Engineered Air's LM / LMD Series custom air handling units offer you the best of all worlds in designing your air handling system. 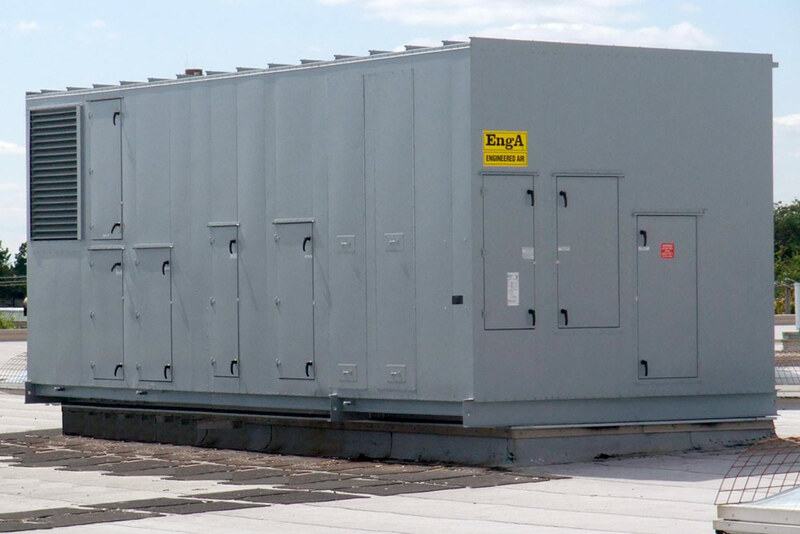 Combined with our custom coil manufacturing abilities the LM / LMD Series can be configured with heating coils, cooling coils, evaporative cooling sections, return air mixing box, or even heat recovery packages. 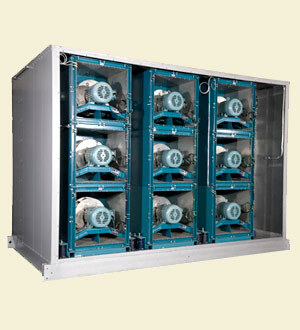 The LM series units are designed with forward curved fans, backward inclined fans, airfoil fans, or plenum fans. The custom design of the LM / LMD Series of air handling units allows component selections to suit the distinctive nature of each application. A variety of fans including forward curved, plenum, air foil and vane axial types are available to accomodate individual power, sound and economic criteria. A wide choice of models is offered, including horizontal. 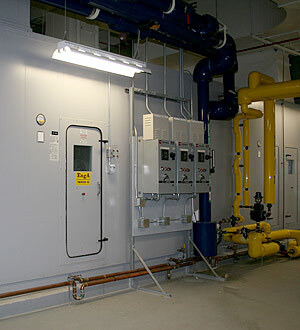 vertical, draw-thru, blow-thru and multi-zone configurations for indoor and outdoor applications. Heating and cooling requirements can be met with optional hot water, steam, electric, chilled water and refrigerant coils. Quality assurance and proven reliability are a result of well designed and rugged units built by experienced and qualified engineers, designers and assemblers. Quality control inspections and rigorous testings are performed at all stages of manufacturing in Engineered Air's modern plants. LM / LMD units are certified by ETL. High efficiency heating and cooling coils are produced by Engineered Air with hot water and chilled water coils being approved by AHRI. LM / LMD units may be factory pre-wired with disconnect switches, motor starters, damper motors and controls, to reduce field installation costs and provide a fully tested and guaranteed product. The standard LM / LMD Series of air handlers offers selection flexibility and versatility in design. 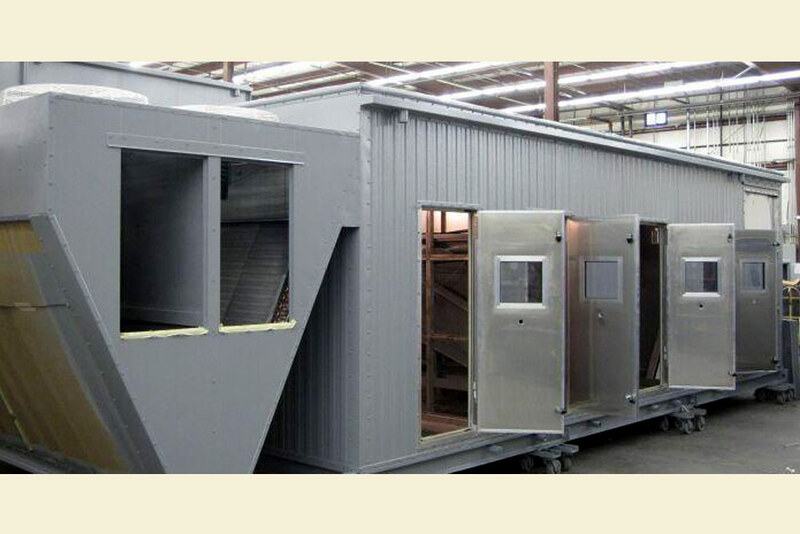 In addition, CUSTOM DESIGNED units are available to accomodate special requirements, including large air flow capacities, physical limitations, hazardous locations, extreme climatic conditions and corrosive atmospheres. 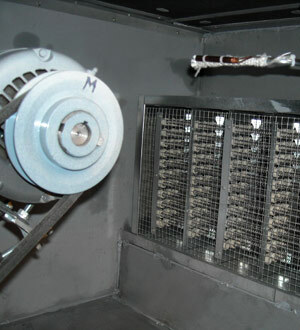 Energy recovery LM / LMD units, incorporating enthalpy wheel, heat pipe, plate and coil runaround systems, provide substantial operating cost savings. An international network of Engineered Air sales offices with technical service support and dedicated personnel are equipped to provide prompt and efficient assistance. Engineered Air's LMK Series custom air handling units offer you the best of all worlds in designing your air handling system. Our LMK electric heat units incorporate our H-TRAC binary control for heat modulation. 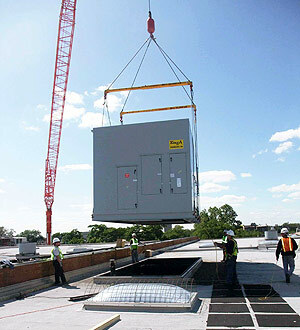 By staging the heat supplied this control minimizes utility bills while ensuring that the buildings comfort requirements are met. Our air handlers are catalogued with air capacities between 750 CFM and 70,000 CFM - (Custom applications provided up to 150,000 CFM). The custom design of the LMK series of air handling units allows component selections to suit the distinctive nature of each application. A variety of fans including forward curved, plenum, air foil and vane axial types are available to accomodate individual power, sound and economic criteria. A wide array of filtration, humidification and control options complement the line. Quality assurance and proven reliability are a result of well designed and rugged units built bu experienced and qualified engineers, designers and assemblers. Quality control inspections and rigorous testings are performed at all stages of manufacturing in Engineered Air's modern plants. LMK units are certified by ETL. LMK units may be factory pre-wired with disconnect switches, motor starters, damper motors and controls, to reduce field installation costs and provide a fully tested and guaranteed product. 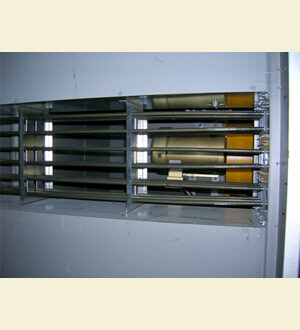 The standard LMK Series of air handlers offers selection flexibility and versatility in design. 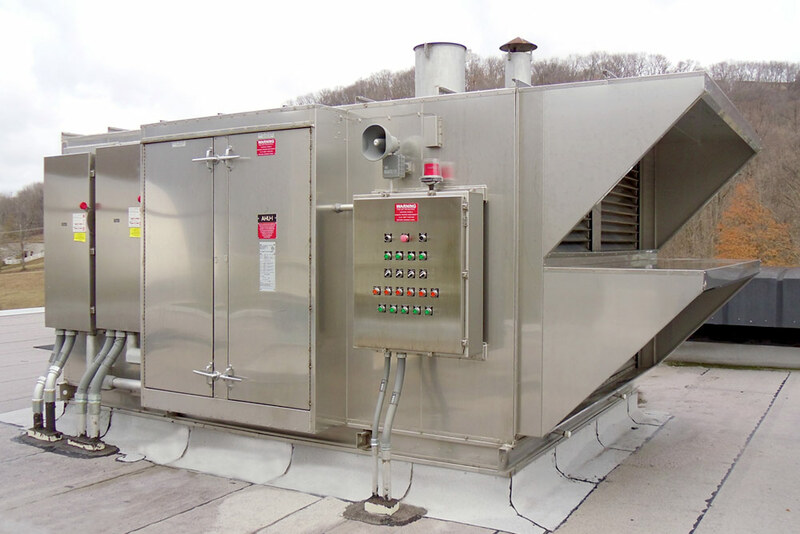 In addition, CUSTOM DESIGNED units are available to accomodate special requirements, including large air flow capacities, physical limitations, hazardous locations, extreme climatic conditions and corrosive atmospheres. Energy recovery LMK units, incorporating enthalpy wheel, heat pipe, plate and coil runaround systems, provide substantial operating cost savings. An international network of Engineered Air sales offices with technical service support and dedicated personnel are equipped to provide prompt and efficient assistance. 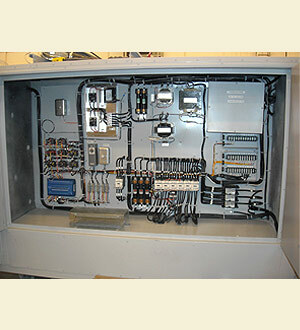 A premium engineered equipment panel system. Specially designed for low temperature air handling units to prevent condensation from forming on the exterior panel and to reduce heat gain or loss. Features a concealed fastening system and a non-CFC polyurethane insulating core. Engineered Air’s NTM Series air handling unit panels are architecturally designed to complement the building envelope, while providing enhanced thermal insulation, particularly for outdoor units, but also for indoor applications where low temperature air is created within the air handler. The superior joint engineering assures an air tight, moisture resistant enclosure for air handlers and packaged HVAC equipment. NTM Series panels are insulated with a non-CFC thermosetting polyurethane insulation that meets model building code specifications. Structural grade steel facings are precisely roll formed and foam insulation is expanded between the metal sheets in a state-of-the-art continuous production sequence that is fully computerized to ensure optimum quality and consistency in every panel. NTM "No-Through-Metal" Series panels with foamed polyurethane insulation is offered in 2” thickness. 4” thick panels are available at extra cost, an extended delivery. NTM Series panels are faced with 26 gauge stucco embossed galvanized steel to ASTM-525 G-90 designation. Base steel shall be structural quality to minimum Grade A 33,000 psi, conforming to ASTM A-446. Optional panel facings of Galvalume, aluminum or stainless steel are available at extra cost and extended delivery. Electrostatically applied alkyd enamel: supplied in Night-Fighter Gray as standard, or colour to suit. Two part epoxy enamel with clear coat glossy finish. Approved for food contact areas in a limited range of colours. Above finishes and colour options are at an extra cost. The panel was tested for Tensile Bond Strength of the metal-to-foam interface to more than 1200 lb. force without delamination. Note: to determine static pressure within cabinet, multiply allowable loading in PSF by 0.192. Example: 2’ panel with a 10 foot span can withstand an internal static pressure of 25.9 × 0.192 = 5.0”w.g. an intermediate structural support will be provided to reduce excessive deflection.